BOOM! 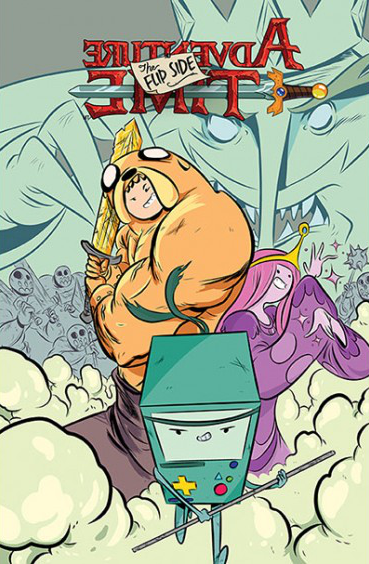 Studios has done a pretty stellar job so far with their Adventure Time comic, attracting a bevy of writers and artists itching to play in this offbeat universe. I haven’t been disappointed yet by any of the spinoffs or one shots, and I’m glad to see such an excellent mix of creators just having fun making comics. 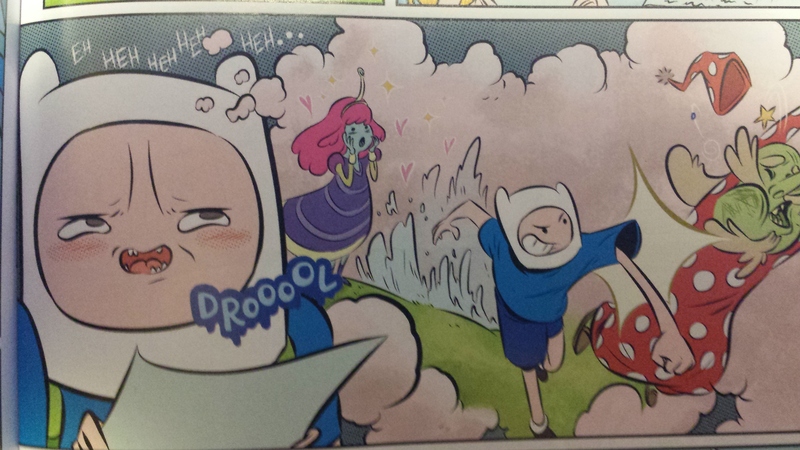 The first issue of Adventure Time: The Flip Side is no exception. Penned by Paul Tobin and Colleen Coover, the team behind the frankly excellent Bandette, this issue continues the trend of taking established fantasy and gaming tropes and turning them into a compelling story. The series begins with the protagonists—Jake the dog and Finn the human—receiving a house call from a doctor. It turns out Finn is severely quest-deficient, and the only prescription is more adventure. So the pair (and living Gameboy, BMO) set out to accomplish various tasks to cure Finn’s ills, including helping a giant tie his shoe, rescuing a centaur’s cupcake from a tree, and finding a way to get the Pancake princesses to sleep. 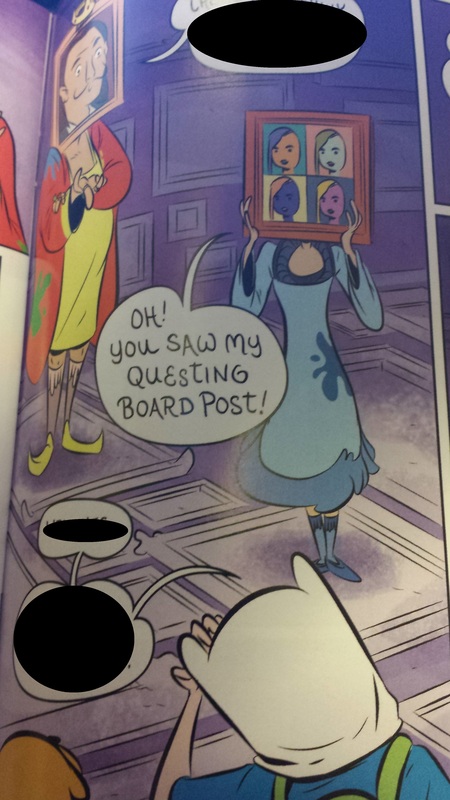 But eventually, they run out of quests, so they decide to visit the watering hole known to most gamers as the “Quest Board.” This is where they find the series’ major plot point: an ad requesting that someone rescue Painting Princess from Monkey Wizard. (Roll with it. All the supporting characters are named this way.) Not ones to pass up a good adventure, the two accept the job and set out to rescue the princess. Although this comic is the standard 22-page length, I couldn’t help but feel I got my bang for my buck. What I described in the synopsis only makes up about a fourth of the book, and there’s enough dialogue to keep you reading for a while without ever feeling like the story is dragging. Wook Jin Clark brings a refreshing fluidity to the series. As for the art, Wook Jin Clark—creator of the upcoming Oni book, Megagogo—is very obviously influenced by manga, which makes for an unconventional but altogether effective fit for the franchise. The looser line work allows for more fluid movement, and Clark inhabits the world with lots of strange and fun characters. I especially like the concept for Painting Princess, whom we meet later in the issue, as her face is constantly changing from panel to panel, each mood evoked through a different school of art. Aubrey Aiese’s letters only help to enhance characters’ speech. My favorite instance of this is the aforementioned Painting Princess’s word balloons, which are lettered in a font that I can only describe as faux-French restaurant. Here, just look for yourself. Overall, Adventure Time: The Flip Side shows what can be done with the series when creative voices are given free reign of the universe. A fun comic all around, I can safely say I’ll follow this one through to its conclusion. This entry was posted in adventure time, Aubrey Aiese, bandette, BOOM Studios, Colleen Coover, Comic Book, Comic Book Reviews, finn, gameboy, jake, kenneth kimbrough, Megagogo, monkey wizard, monkeybrain studios, oni press, painting princess, Paul Tobin, quest board, small press, the flip side, Wook Jin Clark and tagged adventure time, Aubrey Aiese, boom studios, BOOM! Studios, Colleen Coover, comic book reviews, finn, gameboy, jake, kenneth kimbrough, Megagogo, monkey wizard, monkeybrain studios, Oni Press, painting princess, Paul Tobin, quest board, small press, the flip side, Wook Jin Clark. Bookmark the permalink.